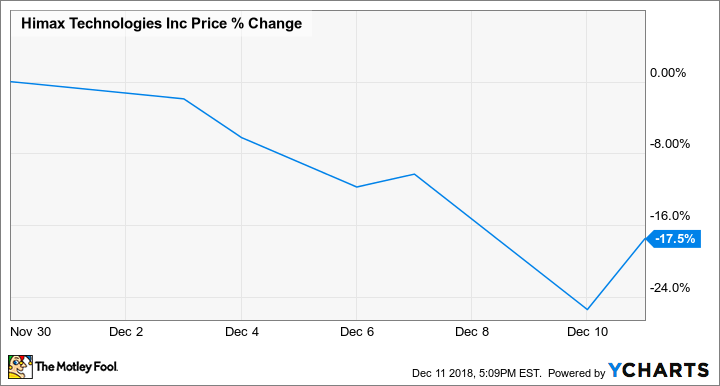 The semiconductor stock has now lost two-thirds of its value in 2018. Shares of Himax Technologies (NASDAQ:HIMX) dipped 21.5% in November, according to data from S&P Global Market Intelligence. The semiconductor company's stock sold off following its third-quarter earnings release and indications of softening demand in the Chinese handset market. Himax stock has struggled in 2018 as sales for its display drivers have declined from their high point and adoption for its 3D-sensing chips has lagged expectations. Shares have lost roughly two-thirds of their value year to date. 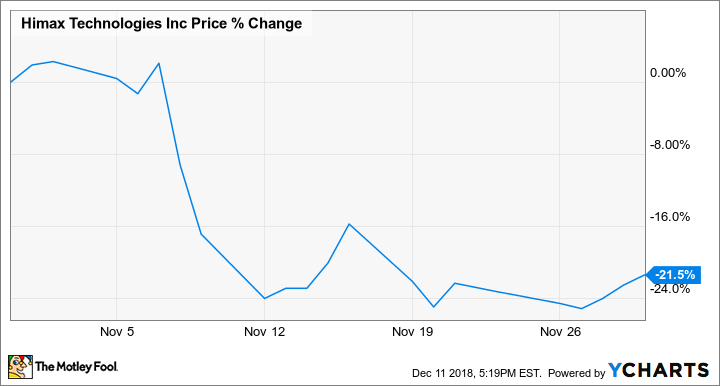 Himax reported third-quarter results on Nov. 8, with sales for the period coming in at $188.4 million -- down 4.4% year over year, up 3.9% sequentially, and missing the average analyst estimate by roughly $8.2 million. Earnings per share for the period were in line with the average analyst estimate at $0.03. Some of the big post-earnings sell-off appears to have stemmed from fourth-quarter guidance that fell short of the market's expectations. Shares were also affected by a broader sell-off for the semiconductor sector after Skyworks Solutions published earnings results the same day and issued guidance that warned of weakening demand for smartphones in the Chinese market. Himax stock has continued to lose ground in December, trading down roughly 17.5% in the month so far amid sell-offs for growth-dependent tech stocks. Management expects sales for the current quarter to come in somewhere between flat and up 5% sequentially, gross margin for the period to be between 24.2% and 25.2% depending on the company's product mix, and adjusted earnings to come in between $0.017 and $0.038 per share. Adoption of its 3D-sensing chips in Android phones continues to look soft, but Himax is working on a next-gen version of the technology that it hopes will improve the cost-to-performance dynamic and make the chips more attractive for handset manufacturers. Himax shares trade at roughly 72 times this year's expected earnings, and the company's dividend yields roughly 2.6% at current prices.